Update: This deal fell through. ZingFu was never acquired. Online identity management platform company ProfileBuilder has acquired ZingFu.com, a social-networking resource site with 600,000 registered members. Milwaukee based ZingFu.com provides “zany content,” with products including Zing, a photo manipulation tool, Pets, a “tomgatchi style toy,” and Zany Cards, pretty much as the title suggests. 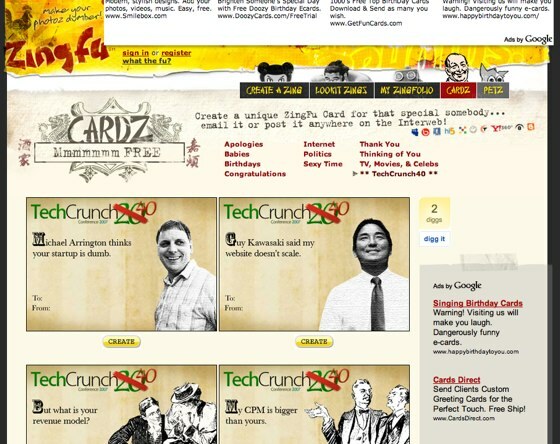 ZingFu.com has released an exclusive TechCrunch 40 zany card section to celebrate the acquisition; see pic below. ProfileBuilder has also entered a partnership with with Mebeam.com, a Sydney Australia based startup that provides online video conferencing. Under the deal ProfileBuilder and Mebeam will exchange resources to build co-delivered sites, with ProfileBuilder users being offered extensive video conferencing tools. The terms of the ZingFu.com acquisition were not disclosed. ProfileBuilder is a sponsor of the TechCrunch40 conference.